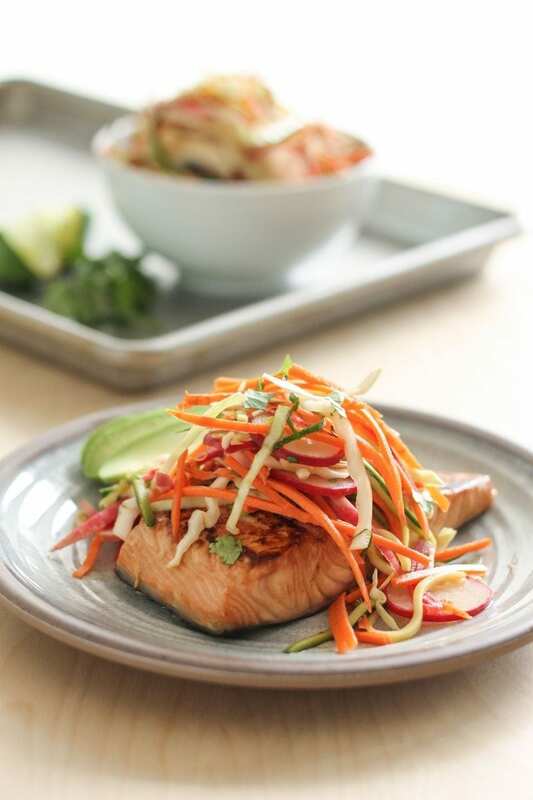 Here’s a question for all my fellow seafood lovers out there: Have you ever noticed that when you cook salmon, there’s often white stuff oozing out of the sides? It’s not pretty, that’s for sure – especially when it comes to trying to take good photos for blogging purposes. This culinary conundrum is one that has been troubling me for ages, but it wasn’t until very recently that I decided to consult good old Google for the lowdown on what the ooze is and how to get rid of it. First of all, what is it? 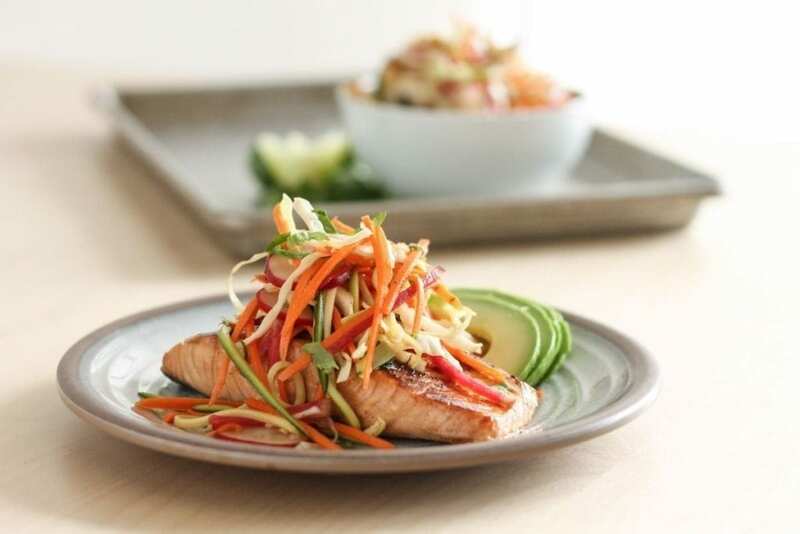 Well, in my research I learned that it’s just protein (albumin to be precise) that gets pushed out of muscle fibres of the salmon – and all fish for that matter – as you cook it. Apparently this happens no matter what temperature or length of time the fish cooks for, and the easiest way to get rid of it is (no surprise here) just wipe it off before you serve. BUT…. that’s not the only solution. It turns out that a little brining beforehand works like a charm too. 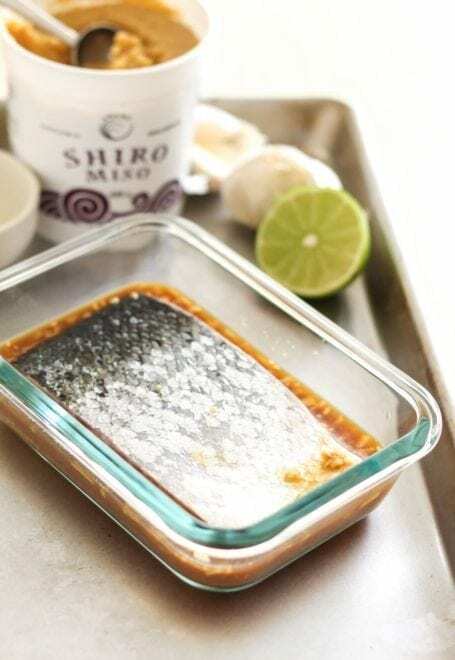 If you don’t want to add any extra flavour to the fish, you’d simply soak it in mixture of 1 tbsp salt dissolved in 1 cup of water. However, the productivity nerd in me wondered if a marinade that was on the salty side would do the same thing. Why not flavour the fish and prevent white goo at the same time? Obviously I had to try it. 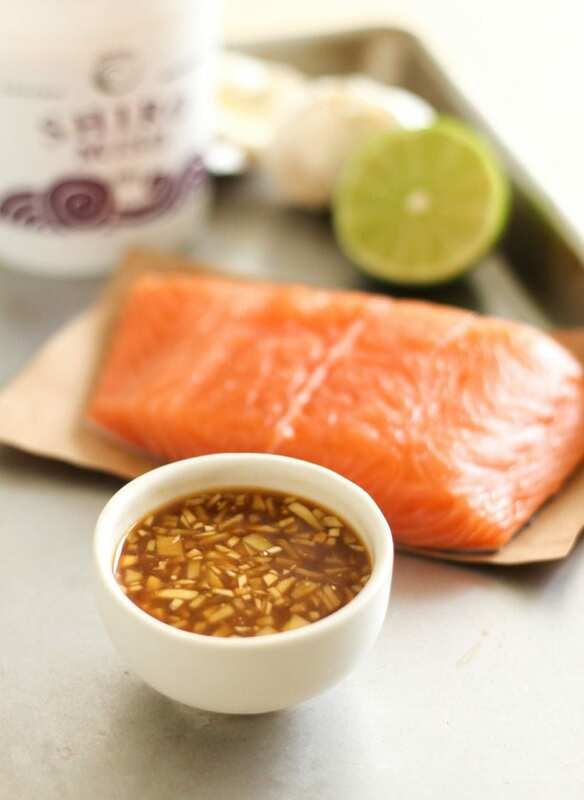 The fish I selected for the experiment was a bit of skin-on wild caught salmon and the marinade was a mixture of minced garlic, ginger, rice vinegar, lime juice, tamari (gluten free soy sauce) and miso (fermented soybean paste). The miso and tamari were the two ingredients contributing to the salt factor, and I let the salmon sit in this little bath for an hour. 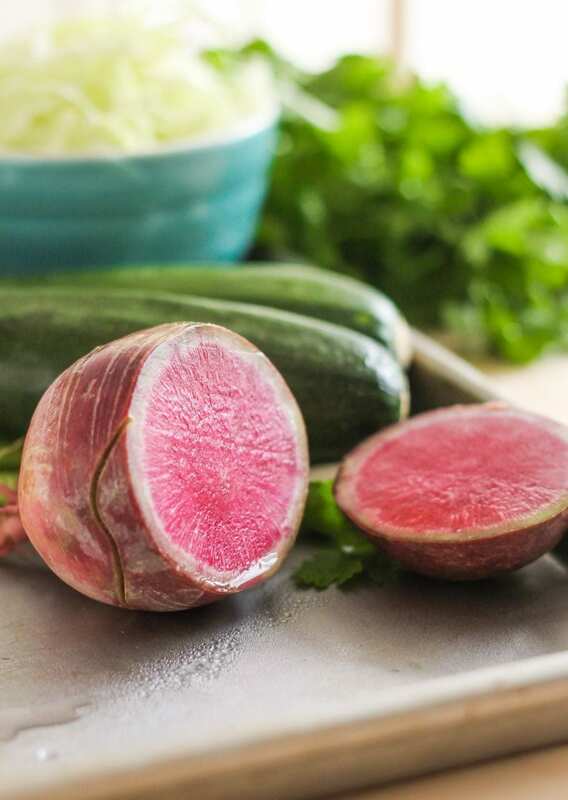 As for the rest of the recipe, the watermelon radishes were speaking to me at Whole Foods earlier that day (actually, everything speaks to me at Whole Foods… this is getting to be a problem), so an Asian-inspired slaw started to come together. 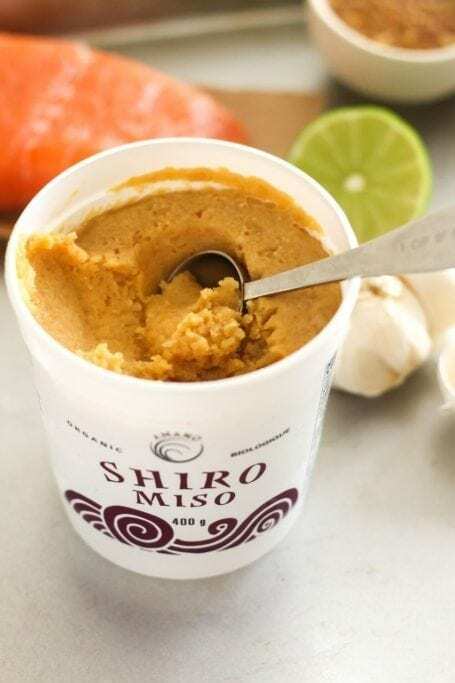 Chop up all ingredients for the marinade and put them all in a shallow, sealable container. Place the salmon fillets, skin side up, in the marinade. Refrigerate for at least 1 hour. 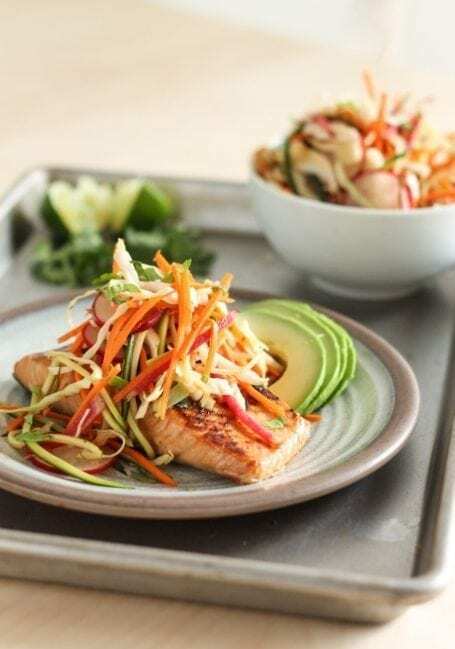 While the fish marinades, prepare the slaw by chopping all vegetables as directed and whisking together the dressing. 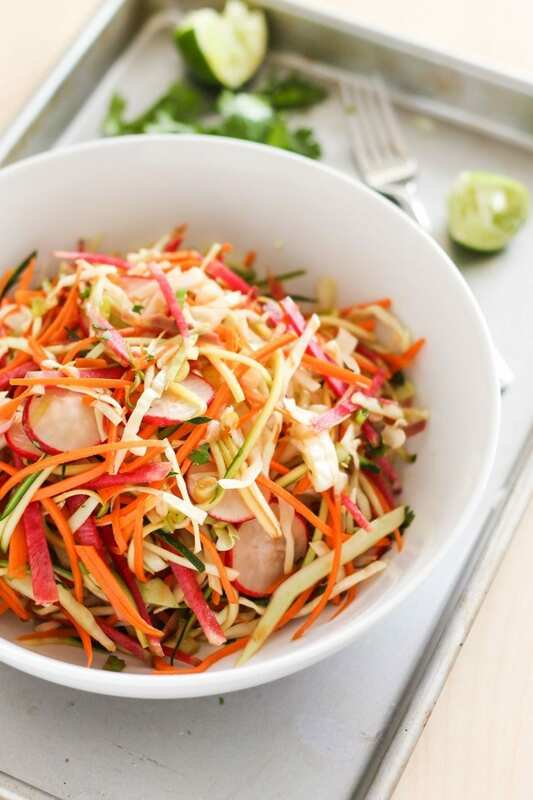 Pour some of the dressing on the slaw and toss well. When ready to cook, mist a large frying pan with coconut oil and turn heat to high. After 1 minute, place the fillets skin side up on the pan. Cook for about 5-6 minutes depending on the thickness of the fish. 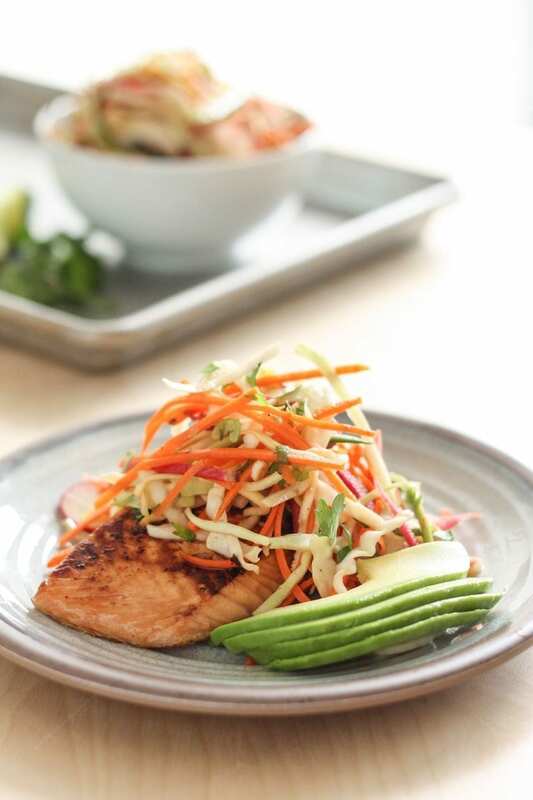 When the salmon is completely cooked, serve it on 2 plates, topped with a cup or two of slaw. Serve the remainder in a bowl on the side. So there you have it. 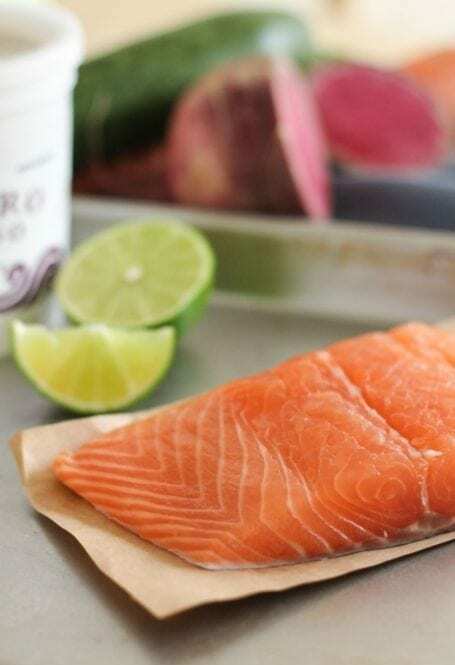 If you’ve been equally as troubled as me when it comes to making your fish look lovely, brining (or putting it in something salty) before cooking is the solution. So far I’ve only tested a 1-hour brine/marinade time, but based on what I’ve read, 15-20 minutes can also be enough to make a difference. On a completely separate note, I wanted to share with you guys that I recently became a publisher on Yummly, one of the a huge recipe sharing community. You’ll notice on the little sharing bars next to each of my blog posts that you can now save recipes to your own Yummly recipe box, which works as a digital way to organize the dishes on your must-make list. One of the things that sets Yummly apart from sites like Pinterest is that it automatically pulls in the number of servings and ingredients list of each recipe you save, then provides you with the approximate nutrition breakdown. 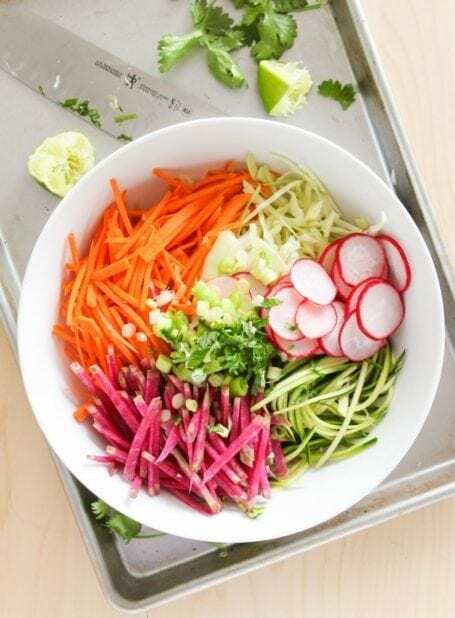 You can also create a profile that indicates your dietary restrictions, likes and dislikes, so that the recipes recommended for you are ones that fit within your needs. Cool, right? You can check ’em out here. 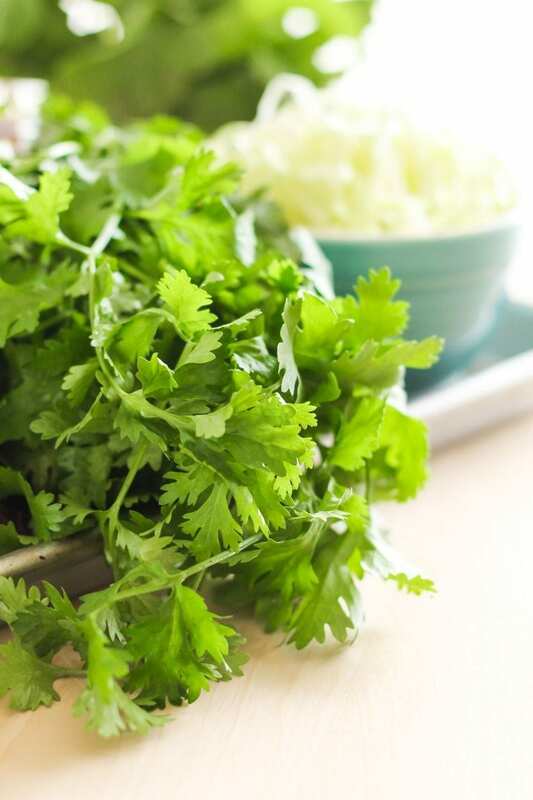 Have you discovered any handy kitchen tricks lately? Where do you save recipes you want to try? 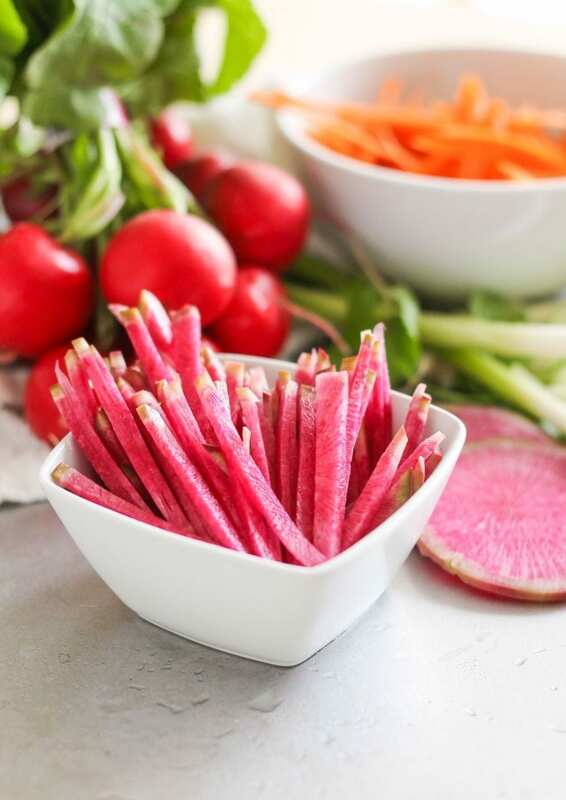 Pinterest is usually my go-to, but I’ll admit that saving a recipe usually ends up leading to browsing several hundred more – as well as a whole bunch of stuff I never intended to find in the first place. 2 hours later…? That looks really great! I hope I can try that someday.